From Oa, the Guardians divided the universe into 3,600 "Sectors," each one touching Oa and radiating outward from it. There has been some confusion about the size and shape of these Sectors over the years, so I will explain. A two-dimensional circle is easy to divide into 3,600 parts -- each 1/10th of a degree wide -- and so it has been rumored that the Guardians simply divided the universe into very thin wedges. However, this is impractical for a three-dimensional universe, and it is not the method used by the Guardians. It has also been stated at times that each Sector is one degree by 18 degrees (18 square degrees). However, this adds up to 64,800 square degrees, which was apparently arrived at by multiplying 360 degrees by 180 degrees. 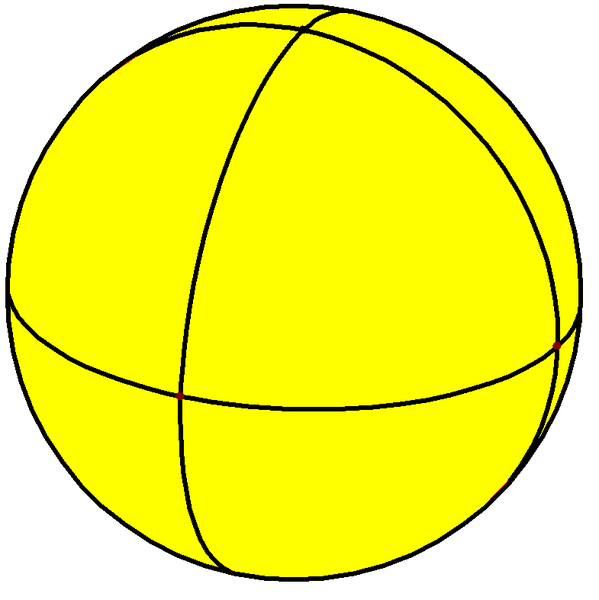 In fact, a sphere has approximately 41,253 square degrees (the proper formula is 360*360/π), so the math is off. Each sector should cover approximately 11.46 square degrees of Oa's sky. Here is a rational way for the Guardians to have divided up the universe into 3,600 Sectors. First, they would have divided the sky of Oa (and, extending outward into infinity, the sphere of the universe) into eight equal segments. This would have essentially given them the spherical equivalent of an octahedron. 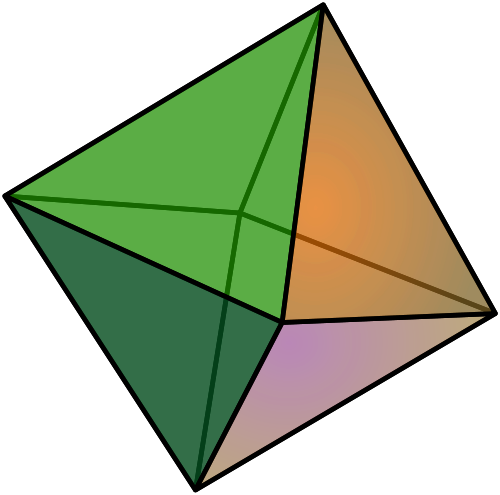 As you can see below, an octahedron is constructed of eight equivalent sides, each of which is an equilateral triangle. Likewise, we have divided our sphere into eight equivalent, triangular wedges. 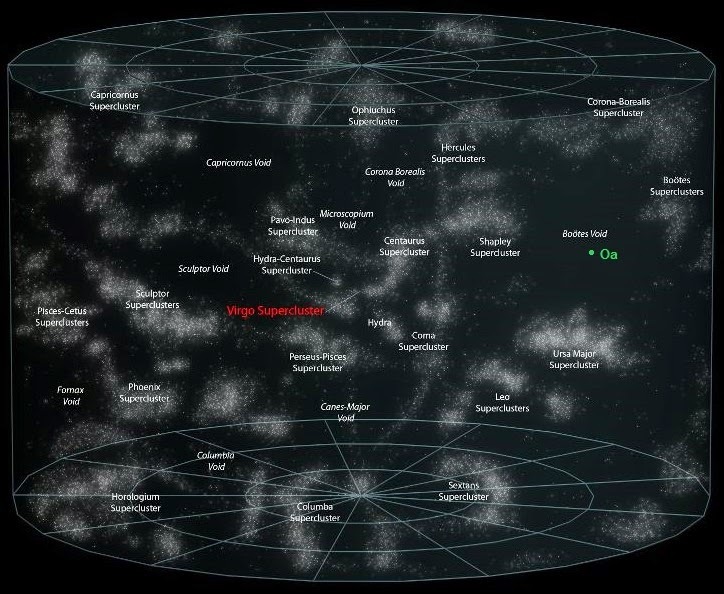 At first, the Guardians of the Universe tried to live up to their self-appointed name by patrolling these 3,600 sectors themselves. Then they built a robot police force to do so, which had disastrous consequences. 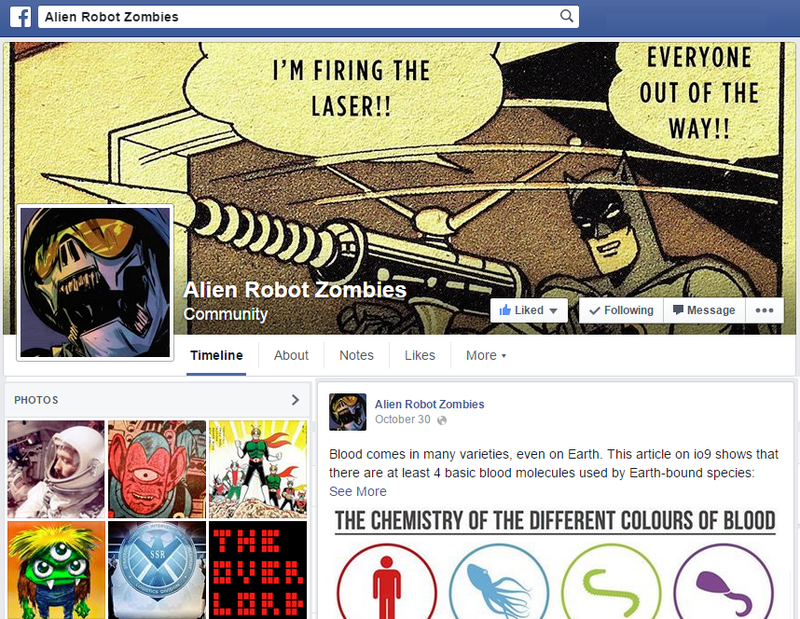 (The robots, known as "Manhunters," congregated and tried to eradicate all intelligent life in one of the Sectors.) Finally, they began appointing an organic police force to do the job, which they dubbed the Green Lantern Corps. Due to certain limitations on the Guardians' power source, at first there was only one Corpsman per Sector. There is now an average of two per Sector. That is still not much, as I will explain below, so the universe is barely guarded, but I suppose every little bit helps. One of the facts that has been established in the lore is that the Milky Way is part of Sector 2814, while its neighboring galaxy Andromeda is in Sector 2813. If you know anything about the scale of the universe, you know that this is highly unlikely. The two galaxies are only about 2.5 million light years apart. In a universe that is at least 93 billion light years across (that's just what we can observe of it - more on this in a moment), 2.5 million is insignificant. To put it another way, the Atlantic Ocean is about 3,000 miles (4,800 km) wide between New York and Ireland. If the observable universe were that wide, the distance between the Milky Way and Andromeda would be 425 feet (130 m). Of course, we do draw political boundaries like that all the time, so it is possible, however improbable. And the closer the two galaxies are to Oa, the more likely it is that they would be split down the middle like that, since the Sectors would not be as wide. Looking in our immediate area of the universe - within one billion light years - a perfect location emerges for Oa: the Boötes Void, also known as "The Great Void." The Boötes Void is what is known as a "supervoid." It is 250 million light years across and contains almost no galaxies. Its center is roughly 700 million light years away -- ridiculously far in human terms, but comfortably close in cosmological terms. Placing Oa in the middle of a supervoid makes great sense, as despite their mission, the Guardians remain somewhat aloof from the universe. 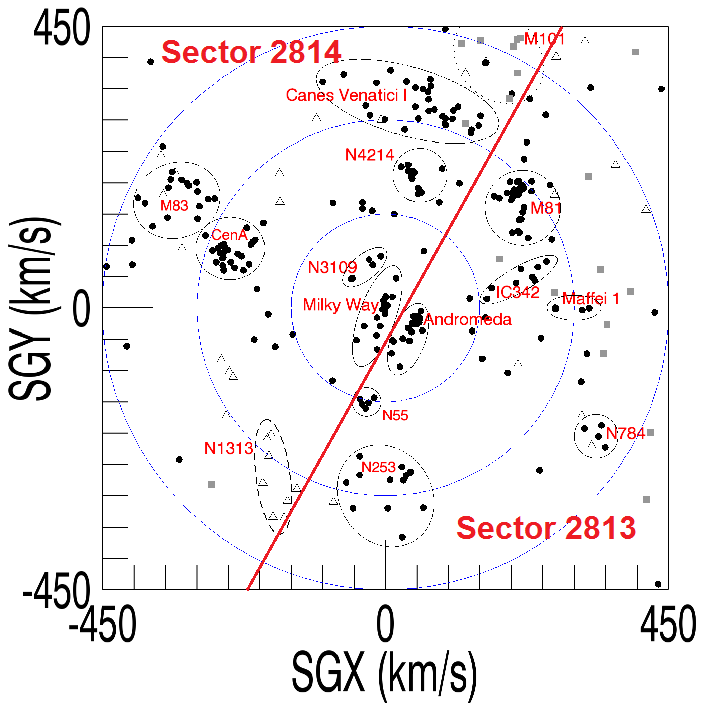 It makes sense that "Sector Zero" would be somewhat isolated and not part of a normal cluster of galaxies. 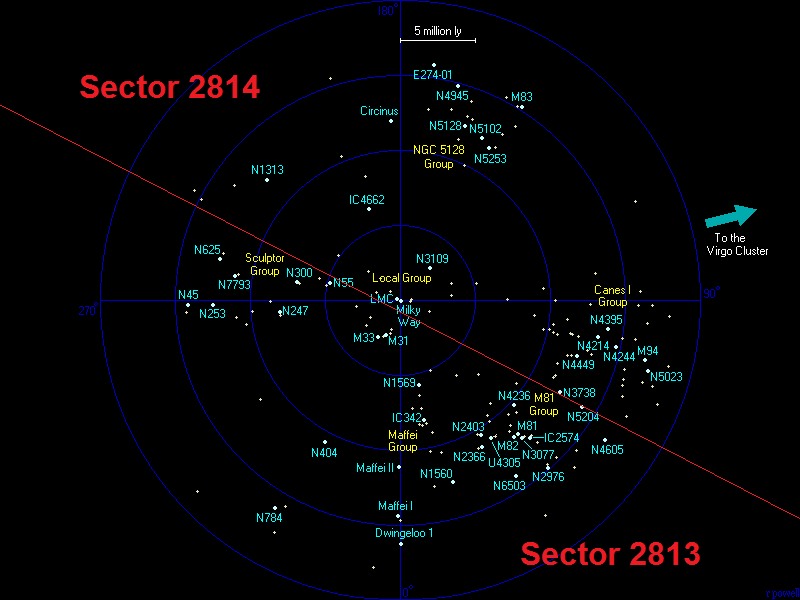 Within our Local Group of galaxies, Sector 2813 would include Andromeda (home of the Skrull Empire and the now destroyed planet Krypton) and its many satellite dwarf galaxies, the Triangulum Galaxy (home of the Shi'ar Empire), and the NGC 3109 Subgroup. Other nearby galaxies in the Sector would include the M81 Group (including the well-known galaxies M81, a.k.a. Bode's Galaxy, and M82, a.k.a. the Cigar Galaxy), the M101 Group (including M101, a.k.a. the Pinwheel Galaxy), the IC342/Maffei 1 Group, the NGC 55/300 Group and the Ursa Major (M109) Group. Sector 2814 would include the Milky Way (our home), the Large Magellanic Cloud (home of the Kree Empire), the Small Magellanic Cloud, and the Milky Way's many other satellite dwarf galaxies. It would also include the nearby galaxies in the Canes Venatici I Group, the Centaurus A/M83 Group, the NCG 1313 Group and part of the Virgo Cluster (although the cluster's core would lie in another Sector - probably 2815). These nearby galaxies would just constitute a small cross-section of these two Sectors, however. As I mentioned before, the universe is a big place. Even if we count just the observable universe - that is, the part from which we can hope to observe data from Earth with the most powerful telescopes we could ever create - we are talking about a scale that will baffle your imagination. Our Sun is one of 400 billion stars in the Milky Way. It is one of 1.5 trillion stars in our Local Group of galaxies (which includes Andromeda, Triangulum, the Magellanic Clouds and several dwarf galaxies). It is one of 200 trillion stars in the Virgo Supercluster, which includes the large Virgo Cluster and several smaller groups of galaxies, including our Local Group. Furthermore, a recent NASA study estimated that 22% of stars had planets in their habitable zones. That doesn't mean that they could support life, just that they are in the right location to do so under the right circumstances. Assuming that everything else is equal, that yields 66 sextillion potentially habitable planets. We don't yet know what percentage of those planets actually does support life. According to my sources (science fiction books and films), it is nearly 100%. However, I will be conservative and predict that 5% contain an ecosystem that has developed beyond microbial life. That yields 3.3 sextillion flourishing worlds in the observable universe. I will further estimate that one in 1,000 of these has developed life forms with a higher level of consciousness and intelligence comparable to or greater than humans. That yields 3.3 quintillion fully evolved worlds. Of those, I will predict that half of them have already destroyed themselves, leaving approximately 1.7 quintillion inhabited planets remaining. Almost 27,800 superclusters per Sector. More than 47 million galaxies per Sector. 18,000,000,000,000,000,000 potentially habitable planets per Sector. 900,000,000,000,000,000 planets with primitive ecosystems per Sector. 9,000,000,000,000 inhabited planets per Sector. That's 83 quintillion stars and nine trillion inhabited planets per Green Lantern. And again, that's only in the universe that we can observe from Earth. The actual size of the universe is currently unknown. there are some who believe that it may actually be just slightly smaller than the size of the observable universe, which if true would mean that we could determine the true size of the universe just as soon as we have a telescope powerful enough. However, most astronomers believe that it is at least slightly larger, with one popular estimate being 250 times larger (by volume), and another plausible estimate being that the totality of the universe is 300 sextillion times larger than what we can observe. Because of the cosmological constant, we know that stars and galaxies are present at the same density throughout the universe, so we can easily extrapolate our numbers. Almost 41,700 superclusters per Sector. More than 70 million galaxies per Sector. 27,500,000,000,000,000,000 potentially habitable planets per Sector. 275,000,000,000,000,000 planets with primitive ecosystems per Sector. 13,500,000,000,000 inhabited planets per Sector. Spending an average of one hour on a planet and working eight hours per day, 200 days per year, a Green Lantern could visit about 1,600 planets per year. At that rate, it would take over 8.4 billion years to visit all of the inhabited planets in a Sector. (Or more than 4.2 billion if there were two Green Lanterns working each Sector.) It is safe to say that there are a lot of planets that are not part of the regular beat of these space cops. It is likely that the Green Lanterns stay close to home: giving highest priority to the galaxies closest to Oa, and only venturing further into deep space when something truly odd is happening. In fact, the Milky Way was probably somewhat out of the way and on the very border of the Corps' patrol when the Guardians gave the Psions the Vega System. They probably never expected that the great Abin Sur would one day crash-land on a remote world in that border galaxy and bequeath his ring to an Earthman. Or that the Earthman would spend 90% of his time driving around America with his pal Ollie while the rest of his Sector went untended. No wonder no one likes Earthmen. Awesome article. I really liked reading it all. Congratulations. Something interesting is that with the New 52 Krypton was moved to the Milk Way, making this stuff even weirder. Hi! Enjoyed your article! Something that might make your math easier and/or impossible (hee! ): according to the lantern wiki, the sectors do NOT encompass all of the universe, visible or otherwise. They just encompass areas the Guardians claim to have jurisdiction over. "It is a known fact that the 3600 Sectors of space cover only the areas of the universe that the Guardians presume to influence, and claim to have authority over. There are other areas, indeed entire sectors of space, that the Guardians and therefore the Corps., have no jurisdiction, and in some cases no knowledge of." So it sounds like the Lantern sector system encompasses a much smaller area than the entirety of the universe. The idea of the Green Lantern tooling around the desert in a pickup truck with a goofy grin on his face while a bazillion inhabited worlds go unprotected was pretty damned funny though.